Variasi Performing Arts presents “Malam Di Atas Pentas”, featuring performances by fellow performing groups like Sriwana, Orkestra Munir, Ayunda Lestari and many more. 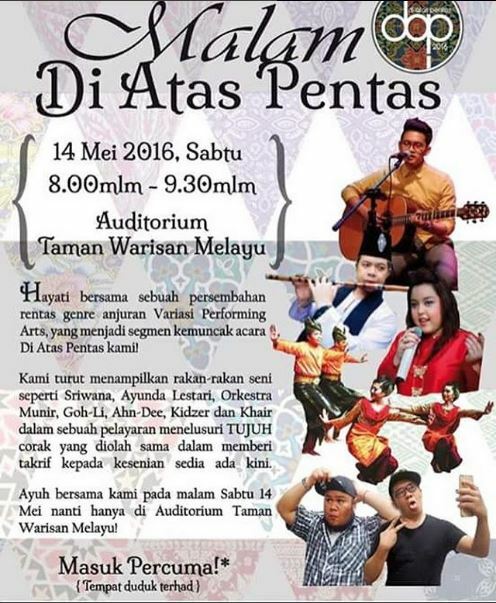 The performance will be held on Saturday, 14th May 2016 at the Malay Heritage Centre Auditorium. Admission is free. Seats are limited, so please contact Ms Tasha at 8571 1207 for registration and more information. We hope to see you!